A recent project has us testing out some of the new Windows Azure features. 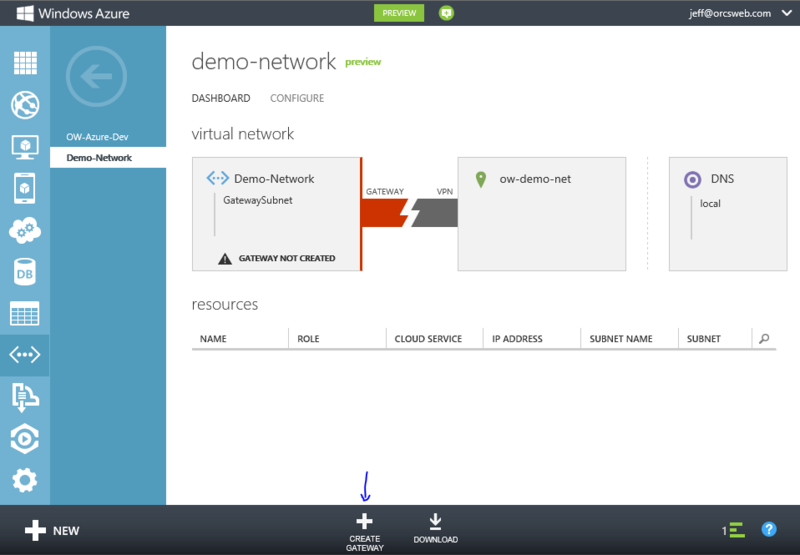 One important configuration step is getting the Windows Azure environment connected to our on-premise network. To do this, we create a site to site VPN tunnel between an Azure virtual network and your existing on-premise corporate environment. Typically, this is done using VPN hardware (such as Cisco, Fortinet, or Juniper) but can also be done using Windows Server. 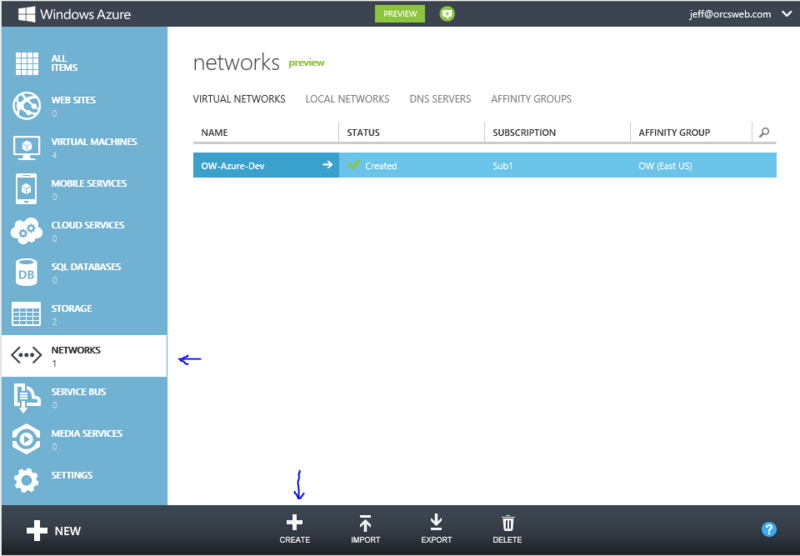 Microsoft has a decent tutorial on how to create an Azure virtual network with cross-premises connectivity, but it lacks some information about the configuration of the remote end. 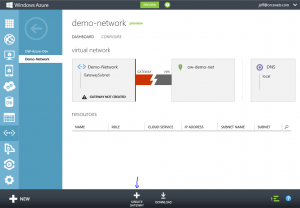 First, let’s get a virtual network created in Azure. 1. Login to the Azure Preview Portal. 2. In the left-hand column, select Networks, and then click Create on the bottom banner. 4. The next screen asks you to define address space and logical subnets. You can use super-netting here to define a large address space (eg. 10.1.0.0/16) and then create logical subnets to group servers (eg. 10.1.1.0/24) for specific server purposes. Define the address space and at least 1 subnet. Click next. 5. On the DNS Servers and Local Network screen, you’ll want to configure a DNS server for this virtual network. For DNS, this will be the DNS server your VM’s in this virtual network use. 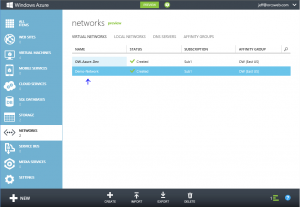 The Local Network settings require both a Gateway subnet and a Local network. The Gateway network should be a logical subnet of the address space you previously defined (ie. 10.1.0.0/24) and is used only for to run necessary gateway services. 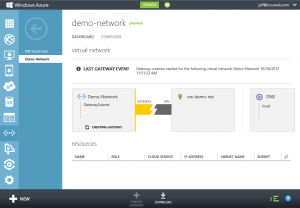 The Local network should be networks configured in your on-premise environment. Select Create New Local Network and click next. 6. On the Create New Local Network Screen you’ll need to assign a name to the Local Network, define the VPN endpoint in your on-premise environment and one or more subnets in the Address Space (eg. 10.4.0.0/16) corresponding to local networks configured in your on-premise environment. Click the check mark to create the virtual network. Now that a virtual network has been created, we need to create a VPN gateway for the network. 1. 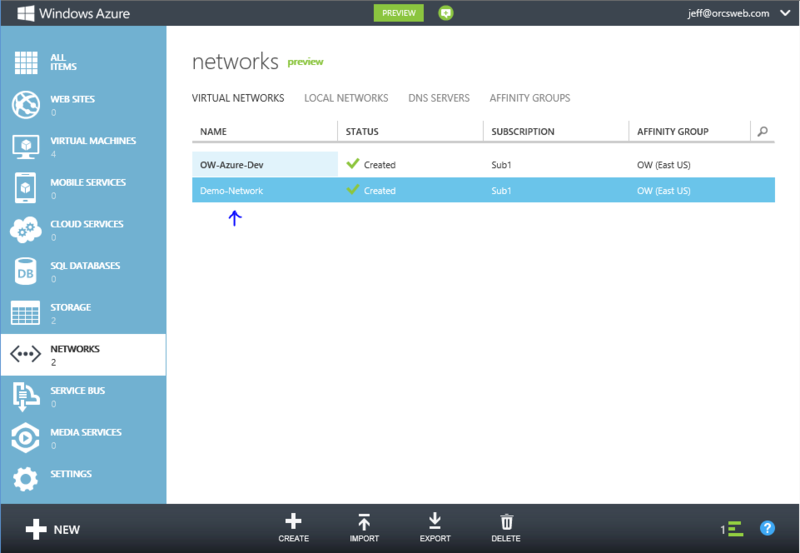 From the Azure portal, select Networks and then click the name of the virtual network you just created. 2. You should see an indicator that a Gateway has not yet been created. Click the Create Gateway icon in the bottom banner. Click the Yes check mark that appears in the bottom banner to start the Create Gateway job. 3. It may take up to 15 minutes for the Gateway to be created. A message should appear that the Gateway creation has started. 4. Once completed, a Gateway IP Address will be displayed along with incoming and outgoing data metrics. You’ll need the pre-shared key information to configure the tunnel on your end. Click the View Key button in the bottom banner. If the subnets do not match on both ends, the tunnel will not establish, so you’ll want to use 0.0.0.0/0 for your Phase 2 subnets in the VPN configuration. You can download a sample configuration script for Cisco ASA, ASR, and ISR or Juniper SRX, J, ISG or SSG systems from the Azure portal by clicking the Download link in the bottom banner (next to the View Key button). You’ll need to modify the script with the proper networks and key. That being said, the scripts assume some things about your configuration so it’s best to configure your end of the VPN tunnel manually. For instance, the script may try to may try to adjust the maximum segment size to 1350 on your VPN device’s external interface which could impact your other configured tunnels. It’s also important to note that firewall and NAT rules are typically required on most VPN hardware devices. To test connectivity, simply initiate traffic from either side of the tunnel (ie. ping 10.1.1.10 from 10.4.1.10). It helps to have debug trace messages enabled on your VPN hardware device in case of issues. Happy tunneling! This entry was posted in Networking and tagged Azure, VPN. Bookmark the permalink. Hi Jeff. I am looking for a way to connect Windows 7 clients to my Azure Server which is also a Domain Controller. The clients are not in a fixed company network. Laptops – used from anywhere. I wonder if it is possible to directly setup the VPN without using the site to site setup? Any help or thoughts on this would be much appreciated. Azure networking supports only TCP and UDP, so you wouldn’t be about to deploy a standard RRAS server and use L2TP or PPTP. Great read. 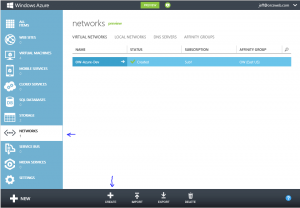 Do the subnet rules mean you can’t have for instance an azure virtual network of 10.1.0.0/16, and local network of 10.0.0.0/8 because they “overlap”? Not on the same virtual network, but you could create two separate virtual networks and tunnels using the overlapping subnets. Your Azure VM’s would belong to one or the other – not both. Azure doesn’t support that type of supernet routing AFAIK. GREAT READ! Thank you! You have answered so many questions I had. I am attempting to do this with a Cisco 2901. Fun Fun! I have a question if you have a minute. I greatly appreciate any insight you may have on this. 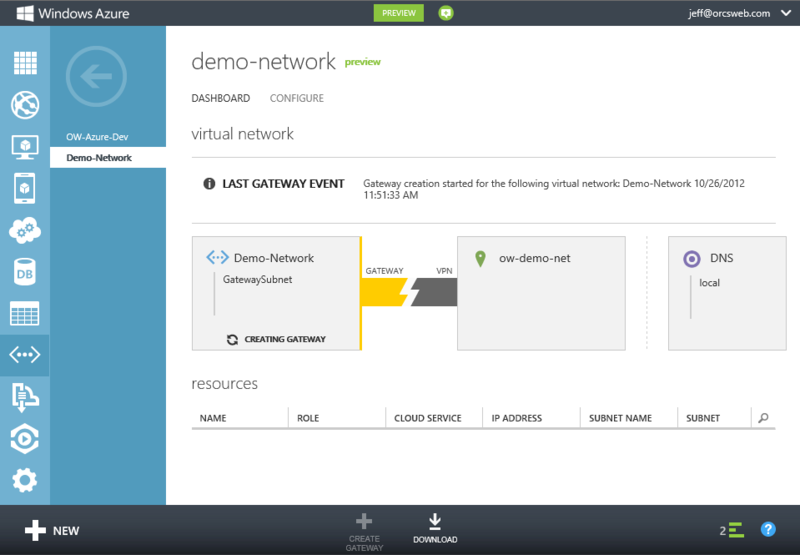 I have my VNet created in Azure, and all is well. However, when I go to create my Gateway, like you mention above, I get the option of Static or Dynamic routing? Do you have any insight on this? If it matters, at my onsite location, I have a Watch Guard firewall as my main gateway, and the Cisco 2901 (my Azure VPN router) is on a separate wan link and is only going to be handling traffic to Azure. ALSO, do you know if I need to setup One to Many NAT on that 2901 (like I would if it were being used as a general internet gateway) or if the NAT wouldn’t be needed since it’s only handling traffic through the VPN tunnel. OH, to get traffic to the 2901 I will using a static route statement in the Watch Guard device (my main internet gateway). Thank you thank you thank you for any response you may have! Awesome posting!!! The main difference is that some VPN vendors, like Fortinet for instance, allow you to create a VPN’s in two different ways. One that is policy-based that allows you to have overlapping subnets for different tunnels, and others that are route based that apply to all traffic on the device. when am trying to connect site to site VPN connectivity from windows azure to fortigate 110 c model firewall, i don’t see the fortigate vpn device in the list when i click on the download vpn script, can you please help me out on this. You can configure from the GUI as well. After completing the steps my VPN is working. However on the certificates tab of the network I see “A point-to-site VPN has been configured, but it is missing a root certificate. Upload a root certificate”. Should I be concerned?